This is an ingenious and unique alphabet book in English, French, German, Spanish and Italian. In this book, the names of the animals all start with the same letter in each language. The five different languages always appear in the same order on the page and each language has its own design style. 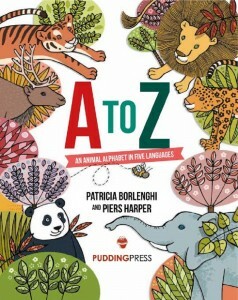 A-Z was first published in 1992 under the title From Albatross to Zoo by ABC. It is being republished by Pudding Press in Spring 2016 and the beautifully fresh illustrations by Piers Harper have been completely redrawn. Piers Harper has worked as an illustrator and writer of children’s books since 1990. His books have been published by Walker Books and Meadowside. Snow Bear is his most successful series. Primarily working on picture books, Piers also has work published in the educational, activity, novelty, games and magazines fields. The first book he ever illustrated was From Albatross to Zoo.